So…are you looking for a Wordpress theme like Medium? Youâ€™re not alone! Medium.com is one of the top 500 ranked websites online right now, and thereâ€™s a good reason why. Itâ€™s one of the most aesthetically pleasing websites for content delivery, with a wide variety of content. There is a demand for more websites similar to Medium, and if youâ€™re a WordPress user - youâ€™re in luck. There are some pretty good options out there for anyone trying to find a WordPress theme like Medium. After doing all the dirty work looking all over the internet, Iâ€™ve put together a list of the top 10 WordPress themes like Medium. So you too can have your viewers easily navigate through your website and its content. Released in 2019, Mundana WordPress Themes has the best of Medium’s latest design. 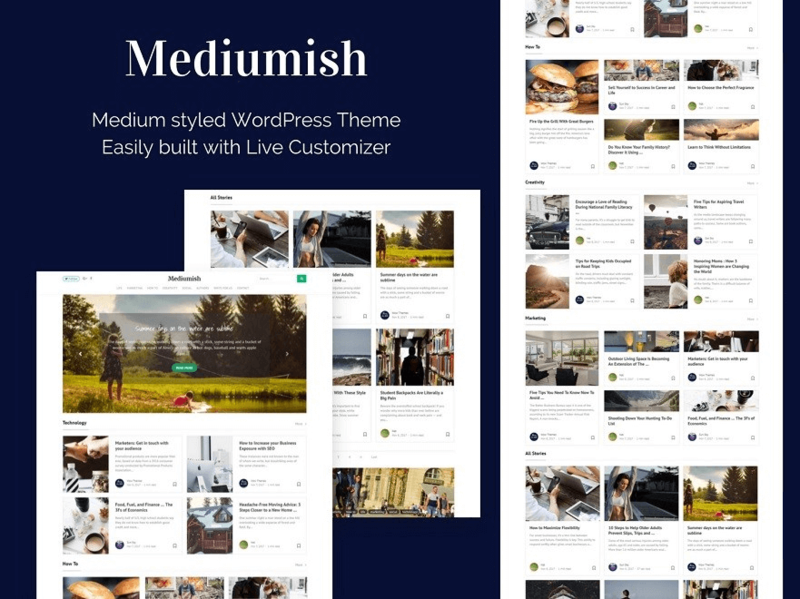 If youâ€™re looking for a WordPress theme like Medium, Mediumish is the go-to choice. With inspiration directly from Medium.com, the Mediumish theme comes packed with many familiar features. The themeâ€™s homepage layout provides a perfect balance between text and images so that your readers arenâ€™t overwhelmed with one or the other. A feature that seems to be overlooked in many other WordPress themes that try to encapsulate the simplicity of Medium. When you head over to an article, you find that elegantly simple layout format that makes reading your content a breeze. The menu floats along with the page as you scroll, and the social icons subtly blend into the side of the page. Peak is a theme that takes on the concept of simplicity while keeping with some of the traditional formatting that you would see on blogging sites. When you visit the homepage youâ€™re immediately shown a grid of featured images for recent articles. Each of these featured images sport a title, but no description. In order for a visitor to know what the article is about, they would either need to click on the image or scroll down the homepage - where thereâ€™s some more traditional formatting. Once youâ€™ve found the article youâ€™re looking for, youâ€™re either greeted with 5 different pictures or one great big picture. This theme is more suited for someone who wants their images to stand out more than their articles. Gema was built around the idea of portraying your content as a journal. Its appearance gives the feel of framed images and news excerpts you would see framed in an old Victorian home. The simplicity of this WordPress theme, allows visitors to quickly glance over the websiteâ€™s offerings and find something that piques their interest. One of the major downfalls of this theme is in its basic design. On the homepage you can either have an image display or a framed text display - you canâ€™t have both for the same article. Once youâ€™re in an article, youâ€™re presented with a funky collage-like header that has the featured image in one corner, the title within a boxed frame partially overlaying the image, and the sidebar sitting up high into the featured image. Medium.com has a very simplistic feel to it, so when looking for a WordPress theme like medium, I stumbled upon WaterMark. WaterMark is a very basic theme thatâ€™s so simple in visual appearance, itâ€™s almost as if someone clipped newspaper pictures out and put them on the front page of their online album. Whenever you manage to find your way into the article you were looking for (through visual cues), the theme offers a nice layout for articles. Array themes kept to the traditional format for their article pages by having a simple title on top and a basic sidebar to the right. When I first saw the theme name, Medias, I was fooled into thinking this was going to be the most similar WordPress theme like medium. After running through the demo offered on Mojo Marketplace I soon found out that although the content was displayed in a similar manner to medium, it still stuck to the conventional blog layout. The Medias theme provides some features on their homepage that replicate the style of Medium, but thatâ€™s only one small part of the entire home page. In this WordPress theme, the creator put in almost every single feature you would find on a blogging style home page. As someone whoâ€™s very familiar with websites, I know what Iâ€™m looking at. To the untrained eye, there might be a little bit of content overload. Anyone whoâ€™s capable of doing a bit of their customizations should be able to make some changes to have the theme more like medium - but once you get into customizing the base theme of a WordPress installation, you start experiencing small problems as your website grows. The article pages in this theme are full of features that take away from the simplicity that you are familiar with in Medium. Perle is a basic WordPress theme, like Medium, that really focuses on the visual aids of pictures. On its default homepage, there isnâ€™t a whole lot of space for providing snippets of articles for visitors to know what theyâ€™re about to read. This theme was built for photographers, artists, and craftspeople as it focuses heavily on pictures. Its WooCommerce support allows visitors to click on a visual image, and be taken straight to a product page where they can add that item to their checkout. For anyone looking to produce quality written content on their website, using this theme can prove to be quite challenging. The article pages allow for a simple blog posting but doesnâ€™t leave much area for additional images. Gillion is a theme that was developed based off of traditional website layouts and revamped with homepage article previews that pay tribute to Medium. Unlike other themes that tried to stay simplistic while adding a lot of features, Gillion doesnâ€™t seem to be too crowded or overwhelming to the average visitor. The WordPress theme comes with many customizable features that allow you to change the way you want your website to look overall. For the people looking for a WordPress theme like Medium, this theme could suit your needs if you were to take out a lot of the sidebar features. The article pages seem to lose sight of the simplistic nature that the homepage was initially shooting for. As soon as you start reading a blog post on this WordPress theme, youâ€™ve got social links to your left, your right, and right below the blog. If youâ€™re marketing tactics require users to share your content, this could come in handy. But if youâ€™re producing quality content already, these features are just producing extra bloat on the page. Rinjani is a theme that seems to understand that visitors donâ€™t just want pictures or text on the homepage. They want both in an easy to navigate homepage. This simplistic theme allows website owners to showcase their articles in an easy-on-the-eyes way. Aside from allowing pictures and text, this WordPress theme allows content to be displayed through small videos on the home page. Finding an article that I find personally interesting on a website using this theme was easy. Unfortunately, once you get to the home page you see that the theme loses it creative simplicity and goes back to the typical article page you see in most themes. I have no problems with this theme, but if youâ€™re looking for a WordPress theme like Medium in the sense of easy to read articles - Rinjani almost has it down. Some minor modifications to the article pages can get you what youâ€™re looking for. Publisher by Array Themes is a really nice theme with a very easy to navigate homepage. Every article snippet is contained within a simple box, placed in a standard grid pattern. The hardest part of creating something simple is keeping it creative. This WordPress themeâ€™s homepage is lacking in creativity, but it gets the point across - quite similar to laying a deck of index cards out on a table in a simple grid. Within an article page, this WordPress theme does a good job containing the content and separating it from the rest of the page elements. The headers are thin, so visitors screens arenâ€™t filled with a full-size image when they first get to the article. Overall Iâ€™d rate the website pretty well. All it needs is some minor improvements to its homepage to help it create a lasting impression on visitors. One way to make your pictures stand out is to make your pictures take up 90% of your website. This is what the WordPress theme Hermes does for your homepage. The homepage provides an elegant design that boasts large pictures and big headlines. One thing that it does seems to be missing is the capability to provide a snippet of the article. Not every headline is going to draw visitors into your article, and thatâ€™s why you need that little snippet of information to draw them in. When you get to an article, the WordPress theme again takes the opportunity to use the whole screen. You are first greeted with a large featured image, followed by the article and sidebar that spans the whole page. The Hermes theme gets the point of simplicity across, but I feel they missed the mark on containing the simplicity so that it gives off the feel of a well-managed page. The text spanning the whole page is reminiscent of the old days of the interweb when text went from left to right, without any containers. In conclusion, what’s the best choice for a WordPress theme like Medium? Mediumish WordPress theme has been specifically crafted to match the simplicity and artistic visual appearance of Medium. Although there are other options out there that offer a similar experience, with Mediumish thereâ€™s no extra coding required. You get exactly what you want if youâ€™re looking for a WordPress theme like Medium.